Some of the hikers: Jay Mead, Phil Rice, Virginia Farley, Lynn Stoddard, and Jed Davis. 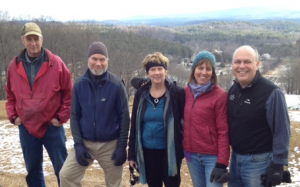 In the first event of its kind, New England Dana Meadows Fellows convened a regional gathering on February 17 at Cobb Hill. The event was designed for Fellows to reconnect, meet Fellows across cohorts, exchange information about regional sustainability projects, explore collaborations, and enjoy the personal and professional camaraderie of others grounded in the legacy of Dana Meadows. The day included hiking, preparing lunch together, and an afternoon in session. Participants came from Vermont, Massachusetts, and Connecticut for the one-day event, joining hosts living at Cobb Hill. Nine of the fifteen New England Fellows were able to attend, representing the non-profit, business, and government sectors. Participants included: Alex Bauermeister, Angela Park, Ashley Lanfer, Beth Binns, Beth Sawin, Edie Farwell, Jay Mead, Jed Davis, Lynn Stoddard, Mike Dupee, Natalie Starr, Phil Rice, Shanna Ratner and Virginia Farley. Read the full report here: New England Fellows Regional Gathering, Cobb Hill, Vermont, February 2012. See all Fellows Network Seminar reports. This entry was posted on Tuesday, February 28th, 2012 at 9:39 am	and is filed under Fellows Blog, SLN Blog. You can follow any responses to this entry through the RSS 2.0 feed. You can leave a response, or trackback from your own site.